But what about the exterior? What do you want your dream home to look like? Do you have to comply with the style of the existing structure or the neighbourhood, or do you have free-range? Cladding can be the wow-factor – the first impression of the type of family or lifestyle inside. It can be the garnish that justifies the practical and beautiful interior. What cladding options are there? Capital Building recommends sustainable, easy to use and aesthetically pleasing lightweight cladding materials. Timber weatherboards or panels satisfy all the above criteria. Timber is a renewable resource and always looks great. Its only downside is it needs regular recoating if painted or stained. There is, however, a growing trend towards using highly durable timbers and just letting them weather. Species such as Merbau, Ironbark, Jarra, Bluegum, Silver Ash and many more lend themselves to this approach. With a bit of research you can easily find a species and look that suits your taste. Rustic, shingle, defined and modern. The secret is in how well your design uses the timber to create a look or feel. It is still important to provide eaves to help protect such cladding if you want it to last long term. There are also some kiln treatments emerging which increase the durability of timbers. 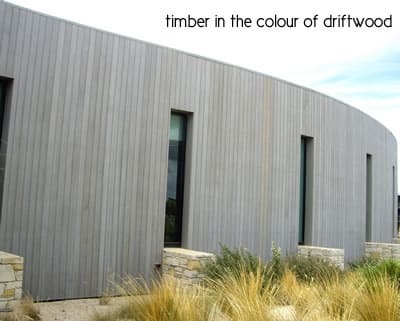 See our Pool House in Alphington, which has Merbau cladding. James Hardie and CSR Cement Sheet and weatherboard products provide the most durable solution for painted claddings. They are more expensive than your average weatherboard but cheaper in the long run due to their low maintenance attributes. 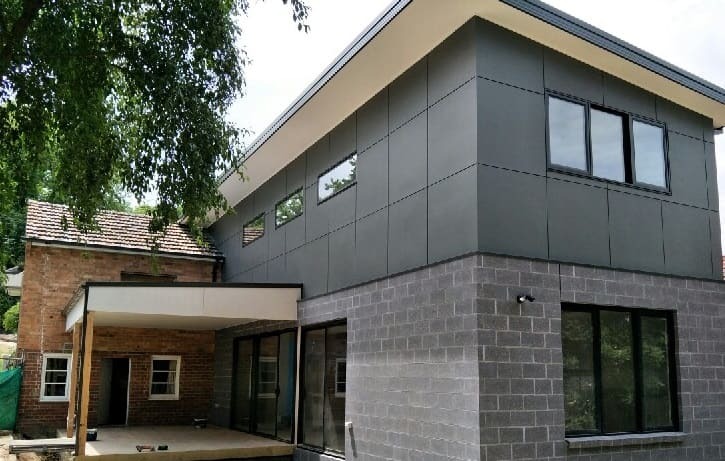 Fibre Cement products do not warp, crack, twist or shrink and therefore always look straight and accurate. Paint soaks into the surface and once painted correctly won’t need repainting for 20 years, (even then only a quick wash and recoat. The variety of sheets and panels to choose from is also vast. Like timber, they are easy to transport and install and thermally very efficient due to their lower mass than bricks or stone, for example, our Beach House, or on the right is an example of Matrix panels with concrete block work. Stone tiles are also a good way of lifting some tired old brick work or weatherboards or introducing another texture to the over all look of a buildings facade. This project in Wonga Park shows how the meticulous application of sandstone and slate tiles has given this previously all weatherboard home a new layer of interest. With these 3 Genres of materials, you have an endless palette of textures, variation, permutations and combinations to achieve just about any look, without having to use heavy and more expensive construction materials. Further, light weight materials require less structural materials to support them and increasing design flexibility. If you would like the team at Capital Building to come and take a look at your building or renovation dream, please call us now, 03 9857 9200.